EASIEST TO USE: The Lowrance HOOK2 9 Fish Finder features auto-tuning sonar and phone-like menus giving you more time to spend fishing and less time dealing with settings. WIDER SONAR COVERAGE: The HOOK2 9 offers a wide-angle CHIRP sonar cone giving you double the coverage of traditional fish finders. 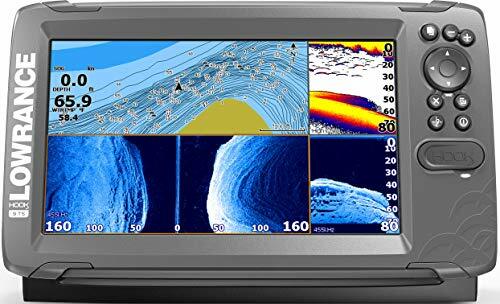 MORE SONAR VIEWS: The Lowrance HOOK2 9 comes complete with a TripleShot transducer which gives you DownScan sonar (straight down), SideScan sonar (up to 300' to each side), and CHIRP sonar (fish arch) views. FISH FINDER & GPS: The HOOK2 9 provides basic navigation with a GPS plotter that allows you to add waypoints, follow trails, and navigate. Lowrance HOOK2-9 Tripleshot US Inland Lowrance 000-14301-001 -- Free Overnight Shipping! Get Your Stuff Tomorrow!